For all intents and purposes, this should basically taste like a Dr. Pepper float right? Without a bunch of carbonation anyway. I know I've said this way too many times, but there is part of me that hopes this will remind me of my beloved ICEE float. Well, after a few moments of drive-thru verifying that they have the shake available, I ordered it up and headed down the road for a nice Dr. Pepper Shake and 10 piece nugget dinner. Was I afraid? Honestly? No. As a kid, we would get two cases of soda whenever we went to Spag's. A case of Coca-Cola for me and a case of Dr. Pepper for my mom. I stuck with Coke most of the time, but every now and then I would swap it out for a Dr. Pepper. There's just something nice about the more complex flavor. I rarely seek it out nowadays, but it is nice to have a Dr. Pepper once in awhile. Ok, backstory done. So, how does it taste? Kind of like you'd expect, if you were expecting something positive that is. Basically, it works, quite well for what it is. It was icy cold like a shake yet still had that familiar Dr. Pepper flavor. For the most part, everything is in balance. 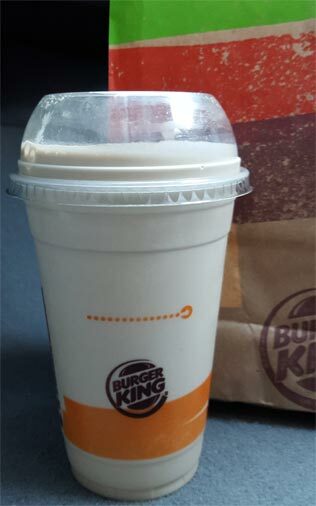 It's a thin shake so I did basically chugged the first third or so of a medium size, but yeah, I was enjoying myself. That said, I want to throw out a disclaimer. Part of me wants to say there is a bit of weirdness to it. Maybe there were just a few spots that were a little too heavy on the syrup, that's possible, or maybe the flavor just lingered a little weird, but just keep that in mind. It's not the end all, be all, ultimate DP float, but if you think you might like it, definitely go for it, just maybe start with a small or split a medium with someone. Neat trick BK. After this initial taste test, yeah, I'm curious to see if they will try it with other syrups. What if it's as simple as adding soda syrup to the shake? That's means we could have any flavor we want and I like that thought. Cherry Coke Shake anyone? 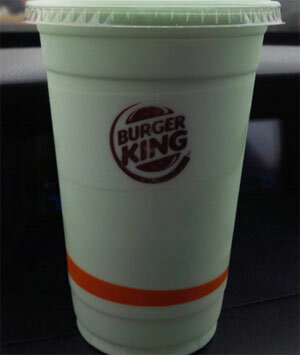 Note: Nick actually made it out to BK first but he tried the Oreo Irish Mint Shake instead. How did it go? One, they forgot the Oreos (like they did on my red velvet shake) and two, the food coloring is indeed what makes it "Irish". That's just sad. I miss Spags! Where else could you get a baseball bat, some pita bread, a coloring book, and some hammers in one stop...and apparently Dr. pepper too. I also had to laugh at the "intensive purposes" because that is what I thought it was for so long too but was informed that it's "intents and purposes"
Since most BK's have a Freestyle machine nowadays, they need to get together with Coke and build Freestyles that can make any flavor a shake. Raspberry Coke Zero shake? No problem! Peach Fanta Shake? Coming right up! Make it happen, Dubba! Peach Mello Yello shake cannot happen soon enough.Look we can do this. We must be heard! Wow be nice cause I love cherry coke.